This year’s annual winter event was bigger and more inspiring than ever. With a musical performance, guest speakers, and our youth leading the way with several activities, the Kids4Peace community ended the evening feeling inspired, proud, and energized. This was in big part thanks to Adan and Omri, a Christian and Jewish participant, respectively, in the Youth Action Program (grades 10-12) who got up to speak at the end about growing up in Kids4Peace, learning about advocacy and social change in DC, and the strength and power that young people today hold. Read the speech for yourself below! I hope everyone is having a wonderful evening. My name is Adan. 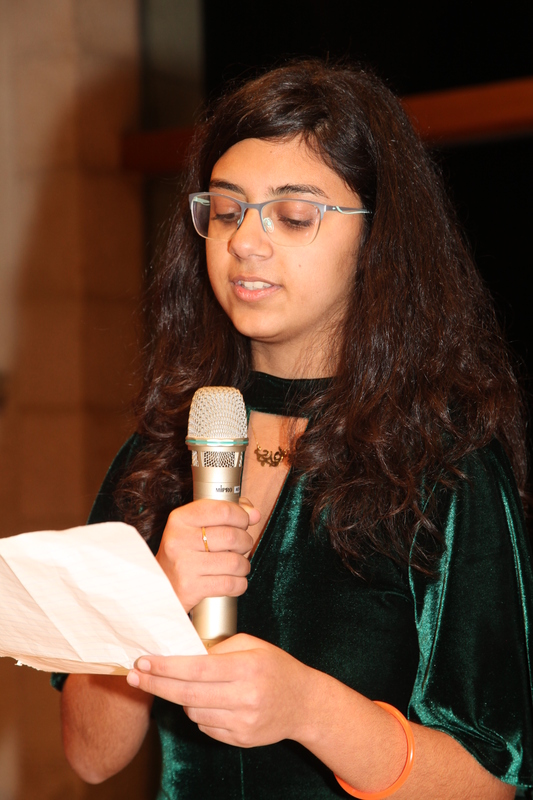 I am 15 years old, and am currently in my 5th year in Kids4Peace. I’m Christian. I am Palestinian, and proud to identify as one. I love my people; I love our customs, traditions, language, food, strength, integrity, generosity, and most of all, I love the dignity found in everything that we do. I love my land and I love every olive tree my people have ever planted, because my land is my home. Being in Kids4Peace doesn’t deny any part of my identity, yet in the past 5 years, I was constantly being told that it does. I have been called a traitor, liar, and coward. I was stigmatized – accused of being fake, accused of being aggressive, accused of being a terrorist. I have thought of quitting Kids4Peace multiple times, because I thought I would no longer be singled out if I did. I am constantly told that I’m still young, I have no idea what I’m talking about, this will never work, and that my little, 15 year old voice will never bring forth any change. Last year in particular, I defied the limits those claims set for me. We travelled to Washington DC, and were up at 6:00 AM, every single day, out of the hotel at 7:00 AM (if we were lucky, 8:00), and had 3 meetings a day with the most influential leaders of today – including Shaun Casey, Dave Harden, ambassadors and diplomats of the highest positions, and the heads of the National Security of The United States of America). I gave a speech about inequality in the United States’ Institute of Peace (USIP), and was absolutely petrified of sharing it, because I feared people’s reaction. Mustering up the courage to give a speech that I wrote at 2:00 AM (practically got 3 hours of sleep because I had to stay up writing it) and managed to make one of the most controversial speeches presented in last year’s program was a defining moment for me. But, it came from my heart and touched theirs. I shed more tears than I’d like to admit in Kids4Peace. In my second year, I regretted ever joining the organization, because the War on Gaza was taking place and I was not with my family – I was out there, at camp in Houston, Texas, the only member of the family to be guaranteed safety, while everyone back home was fighting merely to stay alive. Understanding just how much I regretted my decision helped me realize that the young don’t rank the controversy of who’s right and who’s wrong above the significance of our emotions. I think that’s just as crucial as selflessness when resolving an issue, because we take those stories, emotions, and experiences, and turn them into personal motivation, which we later use to seek change. That is why I love the fact that Kids4Peace is youth based. Kids4Peace understands that our dreams are the future’s reality. They know that our voices are the media and will later become the news. I ask every adult sitting in the audience to do the same. I ask you to acknowledge the voices of your kids, the youth. I ask you to realize what we are capable of because we are works of art. I ask you to recognize that not only can we be strong, but that we are strong. I ask you to remind us that not only are we enough, but that we are more than that. Don’t give up on us, because, at the end of the day, the leaders of tomorrow are today’s youth.